As a means of practicing Lenormand readings, I plan to draw three cards or so early in the day, write down my thoughts, and then see if I have any insights or clarity at the end of the day. An email, text, or message from a man about,...? I don't know what the message could be about. Maybe a way to improve my health and feel stronger. Perhaps an intimidating message, some abuse? I didn't receive any important or intimidating texts or emails. I wonder if this reading could be referring to the fact that my husband was home late last night because he had a union meeting. They were discussing the upcoming contract negotiations. The letter could represent the contract, the man; my husband, and the bear could represent the union. Wait till you see the cards I drew today! Ha! ;-) (I won't be posting those until tomorrow morning, but I got an interesting read.) I like the Tattered Nomad Oracle. Nice cards! 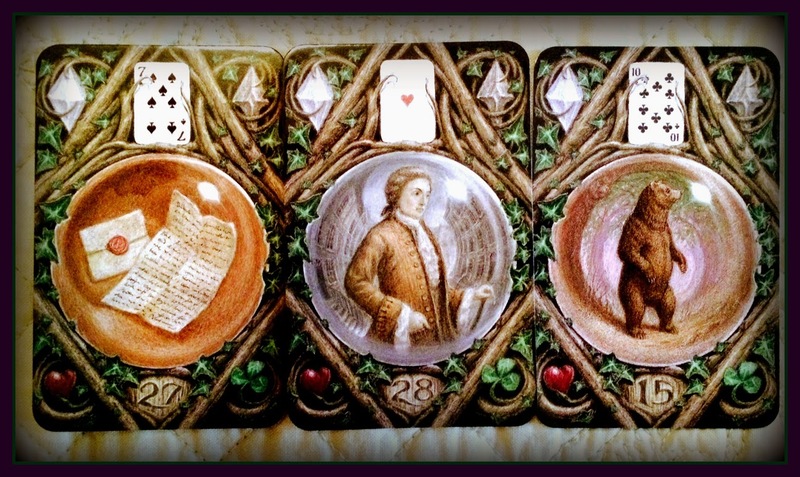 I want the Gilded Reverie Lenormand also.